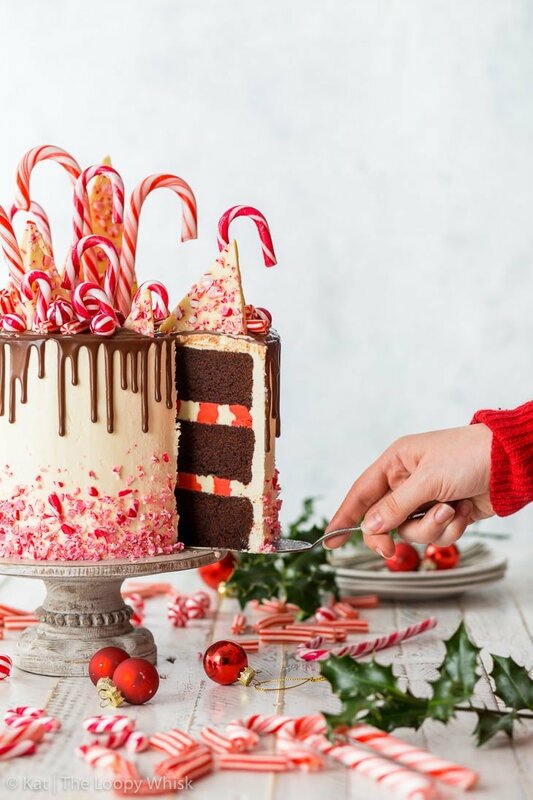 This might very well be the ultimate Christmas cake. 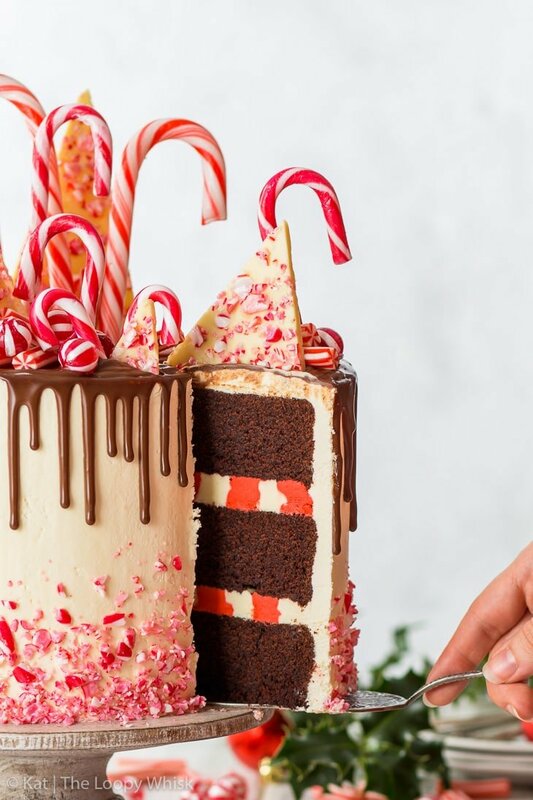 With melt-in-the-mouth chocolate sponges, fluffy Swiss meringue buttercream frosting, a luscious chocolate ganache drip and a small forest of candy canes on top… this candy cane cake is dressed to impress. Hey friend. Get your candy canes and Christmas music ready. We’re making a candy cane cake today, and it’s going to be fabulous. I like making over-the-top desserts around this time of year. 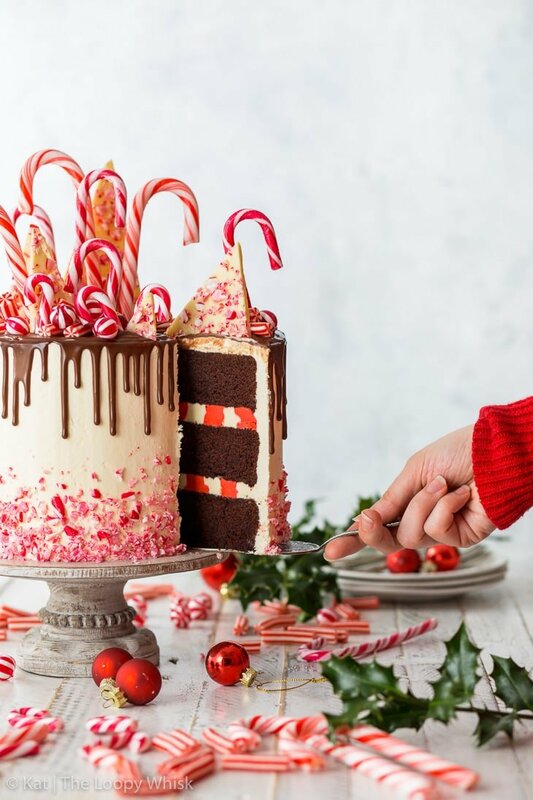 If you ever get the inclination to cover a cake with luscious chocolate ganache drip, stick a small mountain of ultra-colourful candy on top of it, and pile on some more candy just for good measure… now’s the time. So let’s chat about the cake. 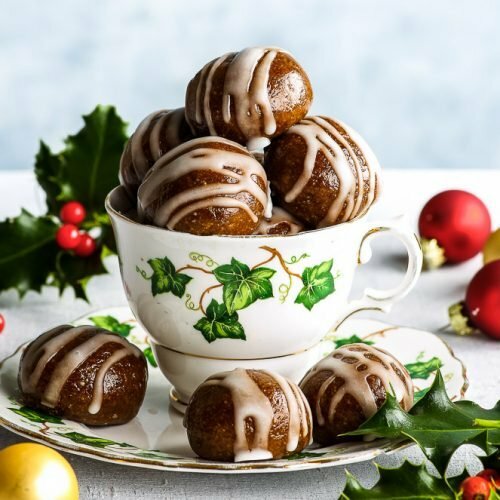 First, we have the melt-in-the-mouth chocolate sponges that taste exactly like hot chocolate (just… you know, in cake form), which we know and love from the ultimate gluten free chocolate cake. Listen, there’s no point in trying to improve something that’s already perfect. Next up, there’s the vanilla Swiss meringue buttercream. I know, I know. 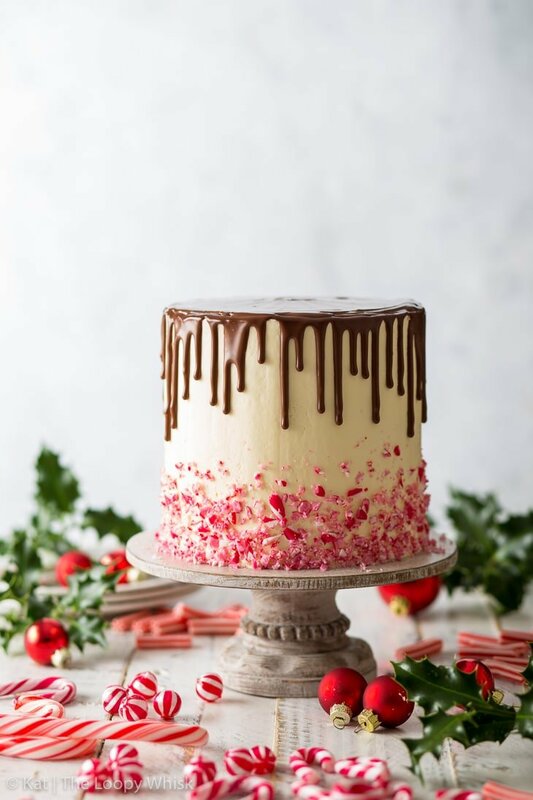 It’s completely horrible of me to go for vanilla, when I could’ve used peppermint to tie the whole candy cane cake idea together. But… I’m just not a huge fan of peppermint flavour. *gasp* Yes, I’ve said it. 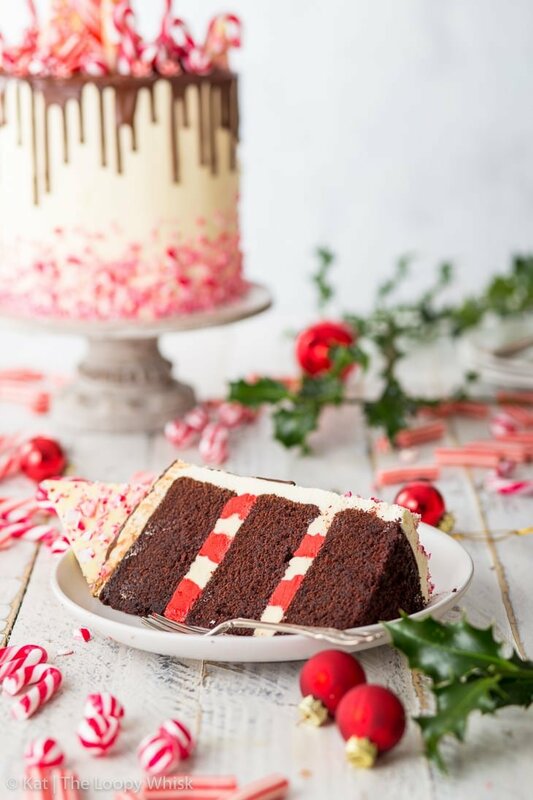 You can, of course, totally add a splash of peppermint extract to the frosting. Or even orange extract if you’re in the mood for that classic flavour combo of chocolate+orange. There’s no rules here, more like guidelines, gentle suggestions. 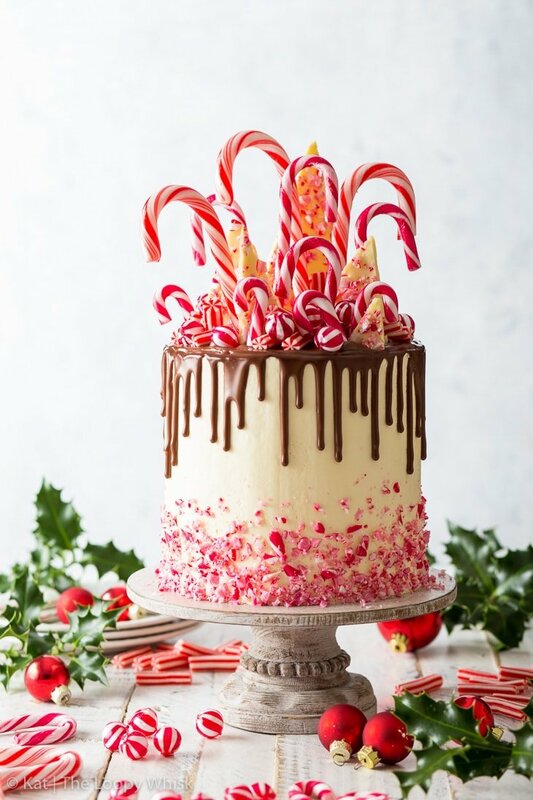 To add more colour to the inside of the cake (and to take the candy cane theme a step further), I coloured part of the frosting with red food dye and piped alternating concentric circles of white and red buttercream to make the frosting layers. 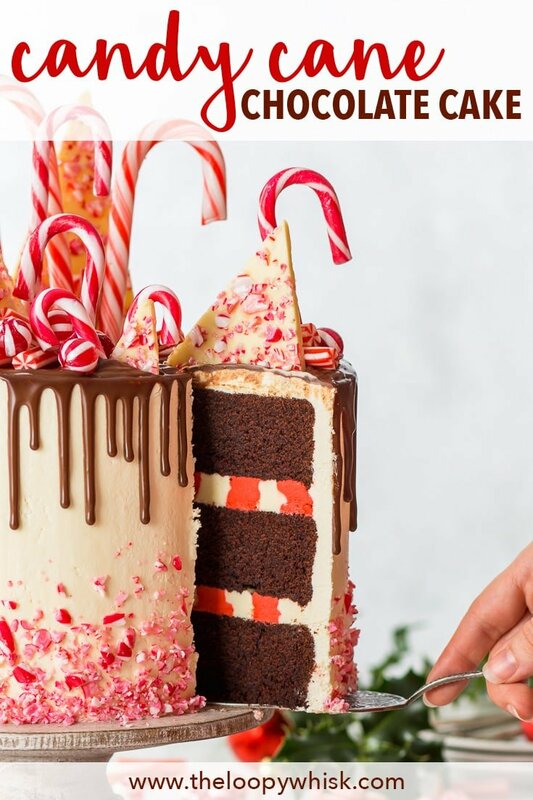 This gives the cake an extra pizzazz, and trust me – when you cut that first piece and expose those wonderful layers… there’s gonna be a whole lot of ooh-ing and aah-ing. And let’s be honest, we’re all partial to a bit of cake-flattery, aren’t we? Now, we come to the the bit we’ve all been waiting for: the decorations. First, a luscious dark chocolate ganache drip. It’s chocolate and it’s pretty – don’t skip it. Then, the candy. So much candy. All the candy. Seriously, anything goes. 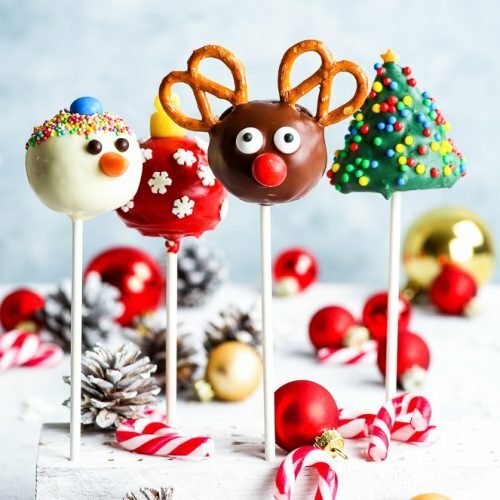 Peppermint bark (that is: melted white chocolate with crushed candy canes scattered on top of it), candy canes, candy cane-coloured candy, candy cane lollipops… so long as it’s red-and-white and fun – just pop it on there. I also crushed some more candy canes (which is an excellent stress-relief, by the way) and made a “collar” round the bottom of the cake. It gives the cake a balanced appearance, and makes it even more beautiful. (I know, that almost seems impossible). 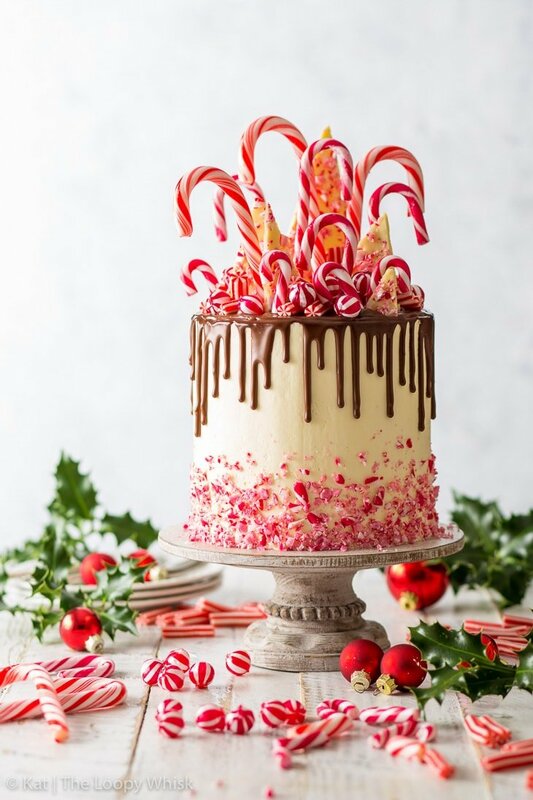 A friend described this cake as “Willy Wonka factory meets Santa’s workshop”. Which is… pretty much spot on. 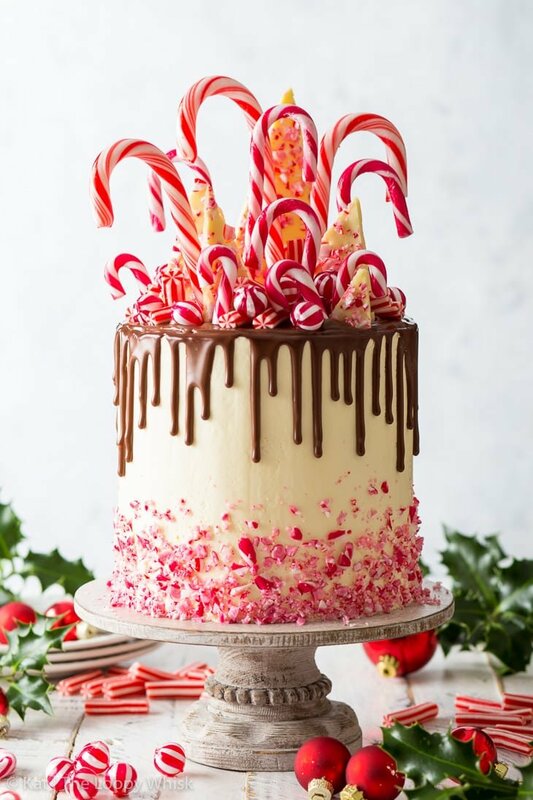 This candy cane cake makes me happy. It makes me smile. It makes me hum Christmas songs (completely out of tune) and want to dress in horrible Christmas jumpers. I hope it does the same to you. 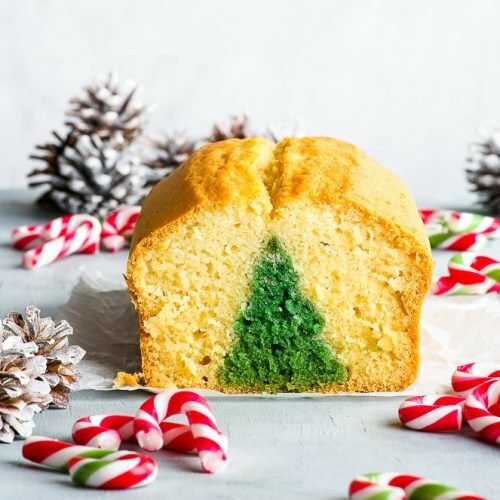 Because if there is such a thing as Christmas cheer in cake form – I think this just might be it. Pre-heat the oven to 355 ºF (180 ºC) and line three 6 inch (15 cm) round cake pans with greaseproof/baking paper. In a large bowl, sift together the gluten free flour, xanthan gum, baking powder, baking soda and cocoa powder. Add the granulated sugar and salt, and whisk well. Add the eggs, milk and vegetable/sunflower oil. Whisk well, until you get a smooth cake batter. Add the boiling hot water, and whisk until you get a runny cake batter with no lumps. 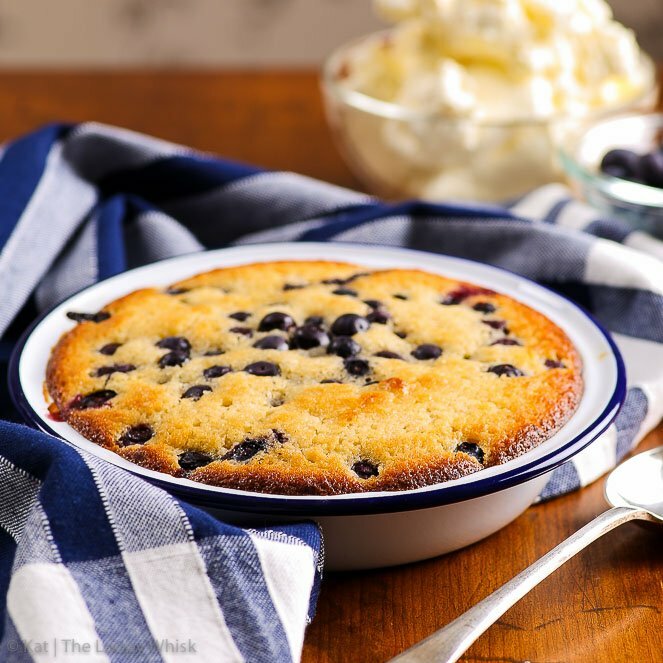 Evenly distribute the cake batter between the two lined cake pans, and bake in the pre-heated oven at 355 ºF (180 ºC) for about 45 minutes or until spongy to the touch and an inserted toothpick comes out clean. Mix the egg whites, sugar and cream of tartar in a heat-proof bowl, and set the bowl above a pot of simmering water. Add the butter, 1 - 2 tbsp at a time, while constantly whisking/beating at medium speed. If using a stand mixer, I prefer to switch to a paddle attachment for this step. Continue until you've used up all the butter. 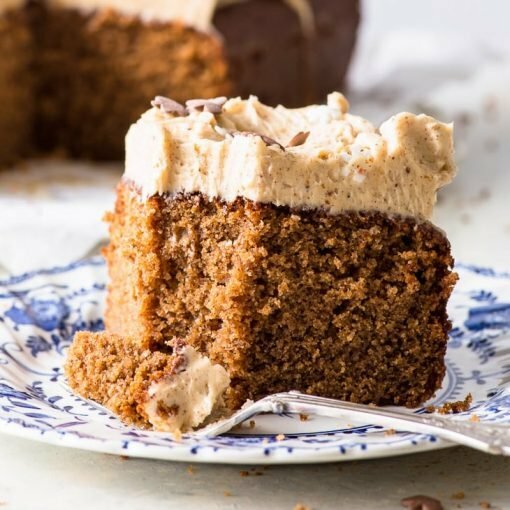 The buttercream will probably look like it's split at some stage (or it might become very runny, almost "soupy") – don't worry, that's normal. Just continue adding the butter and whisking/beating. The buttercream will eventually become velvety smooth. 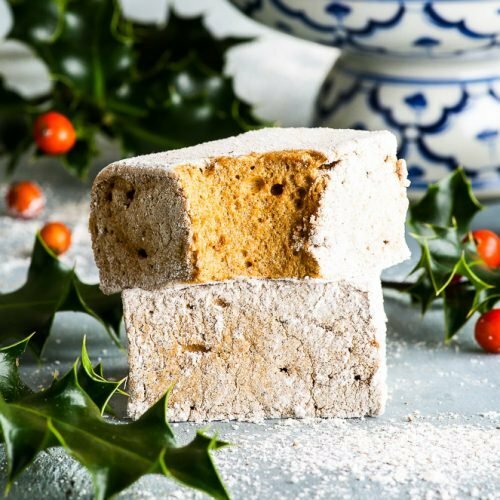 Be careful not to over-beat it, though – you will lose the air (and fluffiness) from the original meringue! Add the salt and flavouring of choice, and whisk/beat briefly until evenly incorporated. Separate the buttercream into three equal parts. Colour one part a vibrant red colour – if it seems too light, add a sprinkling of cocoa powder to get a deeper red colour. Place the chopped dark chocolate into a heat-proof bowl. Heat the double/heavy cream until only just boiling (either on the stove or in the microwave), then pour it over the chocolate. 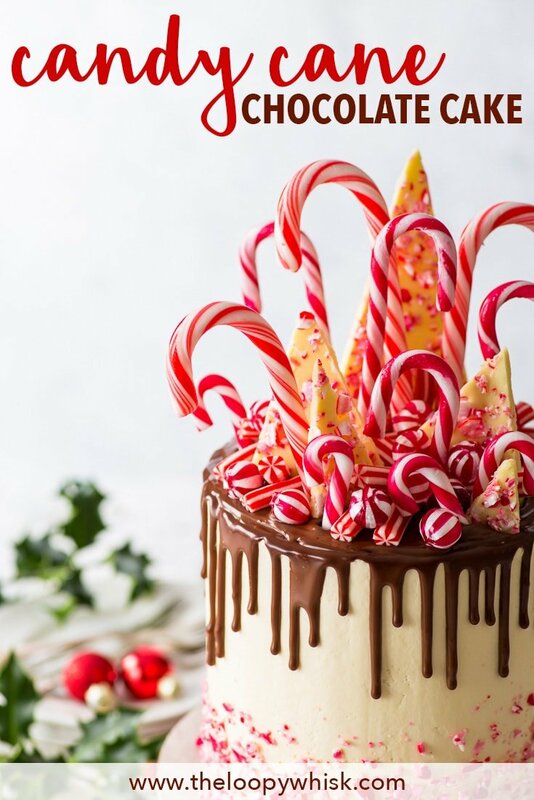 To make the peppermint bark, spread the white chocolate on a baking sheet covered with cling film or aluminium foil, and sprinkle it evenly with crushed candy canes. Allow to set either at room temperature or in the fridge/freezer. 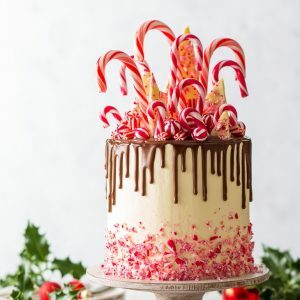 Set some of the crushed candy canes aside (or crush some more if you've used them all up for the peppermint bark) for the "collar" around the bottom of the cake. Place the bottom cake/sponge layer on the cake stand of choice. Pipe concentric circles of alternating white and red buttercream on top of the sponge. Place the other sponge on top and repeat, creating the opposite colour pattern to the one below (if red is the outermost colour in the bottom layer, start with white this time – see post for pictures). Place the final sponge layer on top. Frost the outside of the cake with the remaining white buttercream, creating an even smooth layer. 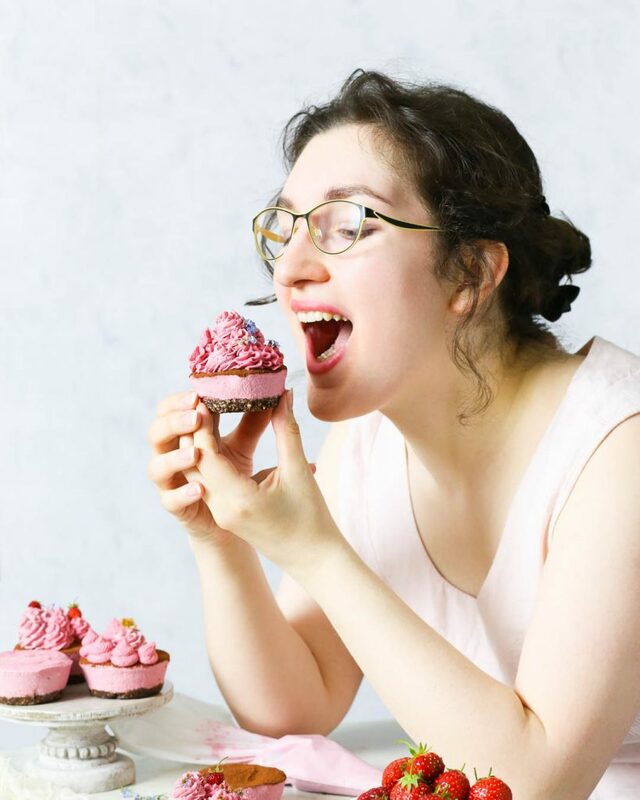 If your buttercream isn't perfectly smooth, you can use a cake smoother (metal bench scraper) dipped in hot water (and dried) to create a super smooth surface by "melting" the outermost buttercream. 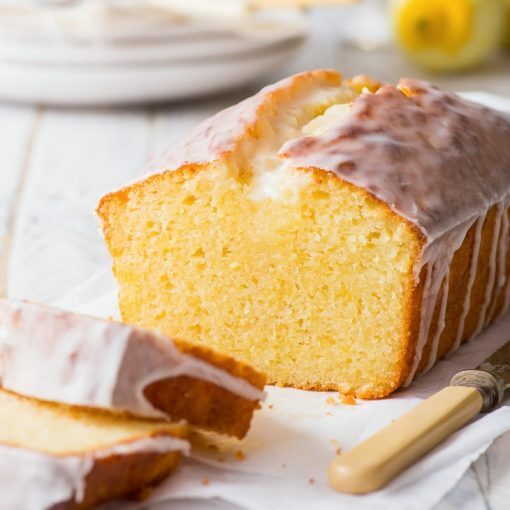 Do this gently – you want to smooth away any imperfections, not completely melt your frosting. Chill the cake in the fridge for about 1 hour. 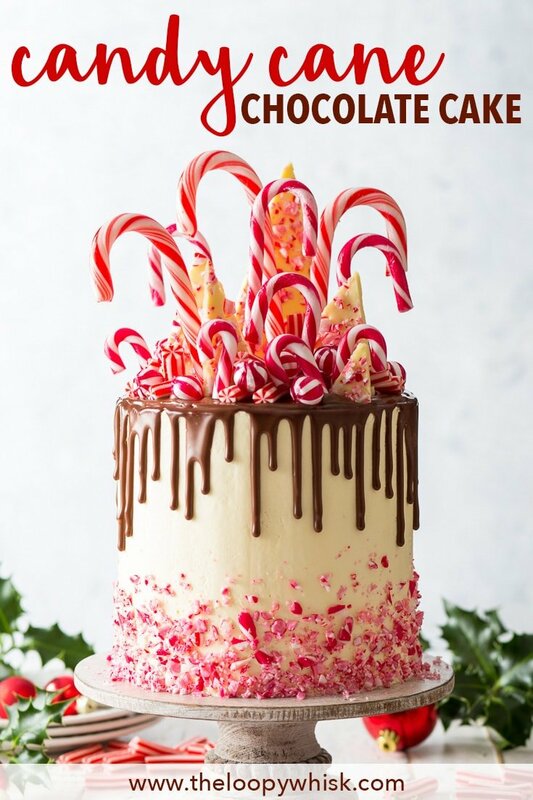 Once chilled, decorate the bottom third of the cake with the crushed candy canes. Check the consistency of the chocolate ganache. It should be runny enough to drip, but not too hot (otherwise it will melt the buttercream). If it's too thick, heat it up briefly in the microwave. For the easiest (and prettiest) drip, transfer the chocolate ganache into a squeeze bottle. 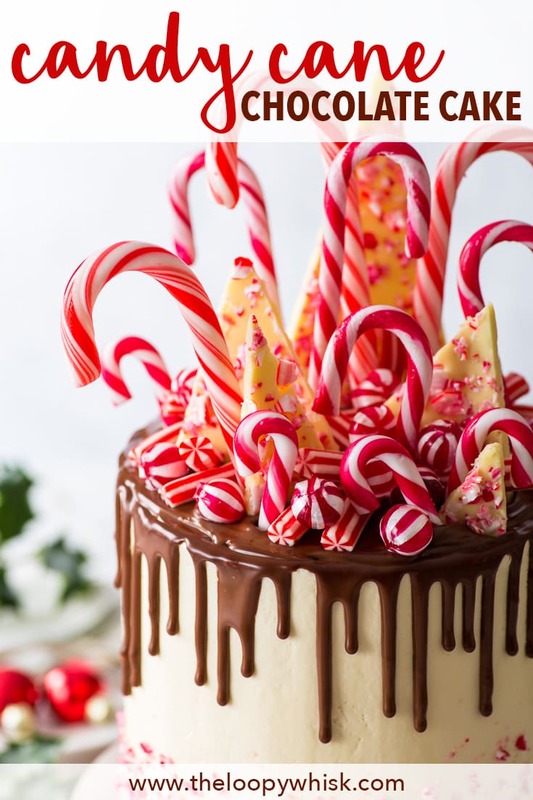 Break up the peppermint bark (or cut in into neat triangles), and use it and the other candy of choice to decorate the top of the cake. 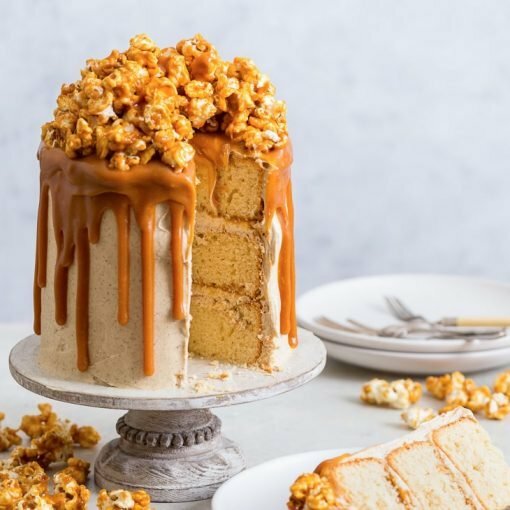 NOTE: The candy can go soft and sticky after a while – I recommend putting it onto the cake just before serving, or just before it's about to be "unveiled". This is my first time that I am making thiscake. Is the middle layer a creamy filling or is it more of the sugar frosting? I’m going for more of a creamy filling and super excited to try this. The middle layer is buttercream (partly dyed red with food colouring). Could you use a cup for cup typ gf flour? Or is the xanthan gum ratio too far off? I think you should be able to use it – if it contains xanthan, just don’t add it separately.